Foot and Ankle Problems By Dr. Richard Blake: Being Part of a Team that Works!! 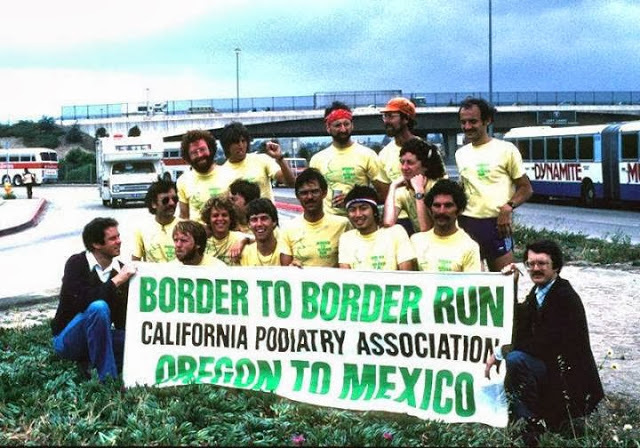 In my twenties, I was able to be part of a 14 person team that ran 1250 miles as a relay from Oregon to Mexico. There were 10 runners (I am above the T in TO, yes the goofy looking one!!) and 4 alternates. We each ran 125 miles that week. I lost 30 lbs in the training, and another 10 on the trip. Not healthy, but sure what an adventure. It was such a highlight in all of our lives that when we come together randomly at a meeting now, that it want comes into the conversation, something that we are all so proud of. We were a team, divided into 2 groups of 5 runners. When one group ran 70 miles in 10 hours, the other group went ahead and did what they could to rest and eat. 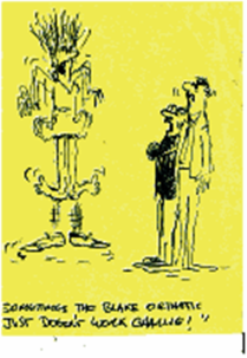 Since it was a publicity stunt for California Podiatrists, National Foot Health Week, May 5-12 1981, we also were constantly interviewed by radio, TV, and newspaper. It remains my biggest athletic feat! My wife and I walked 189 miles in 12 days on the Camino de Santiago in Spain 2015, also a tremendous accomplishment. Why bring this up? As life has passed along, I have been part of many teams at work, recreational, and family. I started this blog 7 years ago (almost to the minute). I knew when I started it that my life would be changed by it, and that it has. You have all become by blog family, some of you more vocal, but all important. I hope this TEAM we have formed can grow. Behind the scenes, only 10% of the blog gets posted, most of my answers are to individuals alone. So, please do not be afraid to write me, and I am sorry when life slows this part of my life down. I am just as proud of this blog as anything I have done in podiatry, or as a human being, because I have tried to make it truly a gift and always part of my life, not something to do. Thank you for helping me teach, cry, and try to love you, as I know by your kind words you feel for me. I thank you.